Teaching kids to knit develops fine motor skills and attention span. All you need are colorful yarns, bamboo needles, time, and patience — plus a few tips and a fun rhyme which I’ll share with you below. Kids in the Waldorf schools learn to knit at age 6, which is when my oldest daughter learned. My younger daughter is learning at age 7. I also recommend that you knit with your kids. Kids need to see us being creative, too. They need to see the process of creation — how long it takes us to knit things, and that we persevere, rip out stitches, pick up dropped stitches, and so forth. 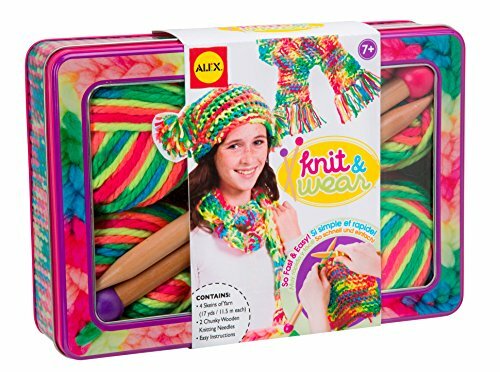 I taught one of my daughters to knit using the ALEX Knit and Wear Kit. We loved the colors of the yarn in the ALEX kit! Plus, the needles were a perfect size for beginners. However, the directions for knitting were difficult to follow. That’s why I’m including photos, an easy rhyme to remember, and tips that you can to use instead. For casting on, I prefer to not show kids at first. I wait until they have the hang of the knit stitch. That means you’ll want to cast on for them. If you don’t know how, this video will help. Once you’ve cast on, meaning there is a baseline of stitches on your needle, you can teach the knit stitch. You’ll want to share how most knitters first knitting looks uneven. That’s to be expected. Tell your kids that they can rip it out and start again, or just keep practicing. They will get better with practice. Knitting alongside your kids gives you time to chat and be together. It also helps kids feel comfortable just sitting to knit — and not feel like they’re supposed to be doing something else which they might if you’re off doing something else. Like casting on, I recommend that you do this for your kids until they get the hang of the knit stitch. The reason for this is that beginners don’t need too much information or they’ll get super confused. Let them learn one thing and get good at it. Then add something else, practice and get good at it. And so forth. 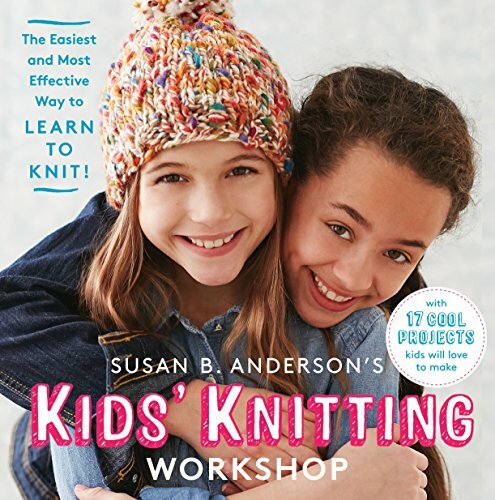 Thank you to ALEX Toys for the review copy of the Knitting Kit. JJ is knitting blankets for her dolls right now. So far she had about 6. Those dolls sure are lucky! 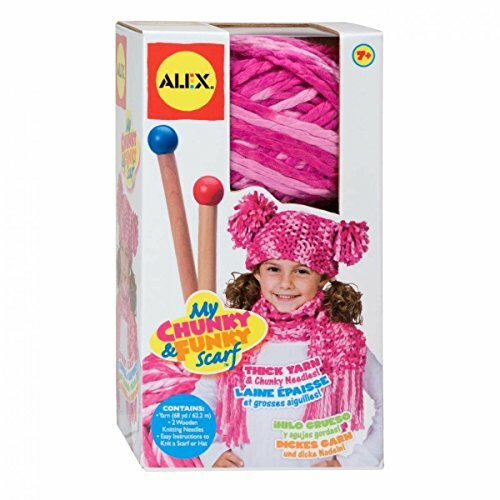 The ALEX Knitting Kit includes patterns for a hat and scarf, both good easy projects for kids. I especially love the tassels! This is great! I do wish they offered more neutral colors. My son would actually love to learn to knit, but all the “kits” come with pink-heavy colors, which he is not into. A fun field trip to a yarn store would probably end in the perfect yarn for him. They usually have the most amazing selections! You might try a local craft or yarn store if you don’t find it online. My grand daughter fell in love with knitting while watching me make a sweater for her doll. These instructions are so clear and the rhyme is a very good memory device for a young person. 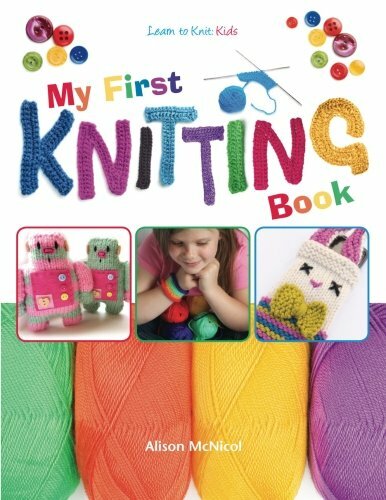 She is going to love this introduction to knitting when it appears in a spaghetti tin along with her first needles and yarn! I hope it’s a wonderful experience! What a cute saying! I’m going to teach my Grand daughter to knit soon. I learned when I was in the 2nd grade, and I’m so glad I learned that young because I have tried to teach some of my otherwise very smart friends, and they just don’t get it. I think it’s actually easier to learn when you’re a kid! But never say “I can’t learn that!”. It’s just a matter of staying with it long enough to “get it” ! It’s a bit tricky casting on and off at first but they do catch on so fast! Have fun! This information was very helpful and fun!! Thank you so much for the slower video. I have tried to learn to knit before, but I was told to hold my hand a certain way. Not much progress. I love these videos. It has helped me tremendously. This was so helpful. I feel like I’m a pretty good teacher, but have struggled teaching others to knit. I taught my kids (7 and 8) using the poem and they learned faster than all the adults I’ve tried to teach in the past 🙂 if you wrote the peom, you are amazing, if you found it and shared it, Thank You! Is this continental or english? Maybe I should have followed this to learn knitting to begin with. Doing so much too soon is confusing and frustrating esp. when you can’t finish something for dropping stitches all the time. 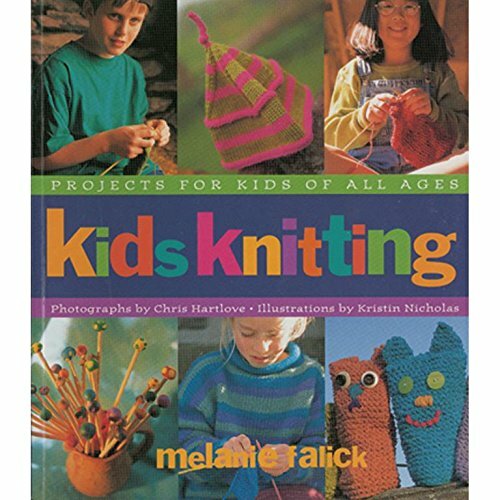 Is there a tutorial for kids on all the stitches needed to know and knitting knows and don’ts,etc. How to fix mistakes etc. Esp. dropping stitches. Do you have a video teaching how to purl? Thank you for this. Now I know why my stitches always end up looking twisted! I’m glad to see kits being made for younger children. Knitting has so many benefits, including increased attention span and decreased stress and anxiety. It’s also important to know that it doesn’t matter what craft your child chooses, as long as they find something they enjoy doing that is creative. Although I knit and crochet, my daughter enjoys cross stitching much more than either of my crafting choices. We still craft together though, which is key! Thank you so much for this…………….Waiting to teach my granddaughter as well. I knit continental and it’s hard to teach others. Love it!!! yeah! Glad it can help! This is great! Have been trying to teach my granddaughter… this will help!!! I been looking for a geared down tutorial that is simple for me to learn. This is far beyond perfect. I watched youtube videos and everything. Thanks! glad to hear it – have fun! I love this post! The step by step tutorial is so useful!